One of the things on your mind as you add dorm essentials to your college dorm checklist is making your college dorm room decor unique. You don't want your college dorm room to look like anyone else's. Plus you want your college dorm room be comfortable and feel like a home away from home. With the right dorm necessities, you can make your college dorm room feel comfortable and like a home away from home while still being unique. For one of a kind college supplies in your dorm room decorations, add our 2.5' LED Rope Light Dorm Palm Tree! Maybe you want to do some dorm room decorating for the holidays but want something a little different. Maybe you don't want a traditional dorm Christmas tree in your holiday dorm room decor. 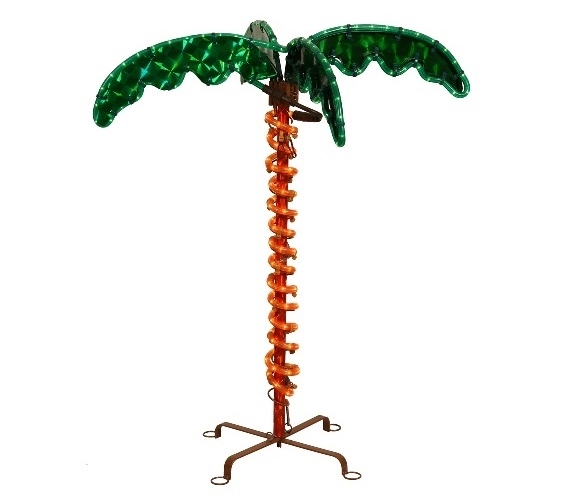 Our 2.5' LED Rope Light Dorm Palm Tree will give you the one of a kind dorm room decor you want while still allowing you to have a traditional dorm tree in your college dorm room. This dorm essentials item features bright green holographic leaves while the trunk is wrapped with orange rope dorm lights. This dorm item can sit in a corner of your dorm room or on top of a college bookcase or dorm nightstand for a fun and unique look that will make your college dorm room feel extra cozy.